In July 2007, we were approached by French artist Jérôme Saint-Loubert Bié, who asked us to contribute to a project he was preparing in Paris. In short, he was planning to do two exhibitions, on two different locations in Paris, at the same time. These two locations were Atelier Cardenas Bellanger and Galerie de Multiples. 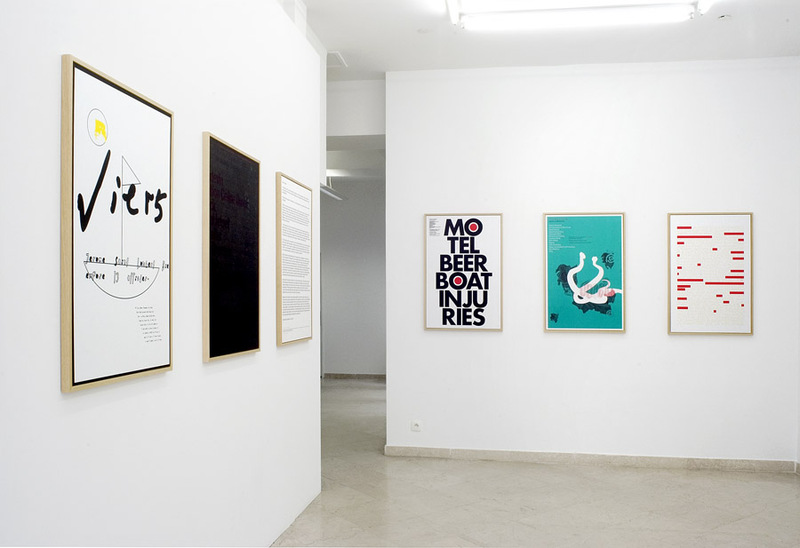 He invited 12 designers to create posters for him, two posters each. The first poster would be hanging in Atelier Cardenas Bellange, and would announce the show at Galerie de Multiples. The second poster would be hanging in Galerie de Multiples, and would announce the show at Atelier Cardenas Bellange. The whole project consisted entirely of these contributed posters; a classic 'the-artist-as-curator' situation. Twelve designers, two posters each: in total twenty-four posters, divided over two galleries, so twelve posters per gallery. This is as clear as we can explain it. We started by just putting the artist's name on a piece of paper. 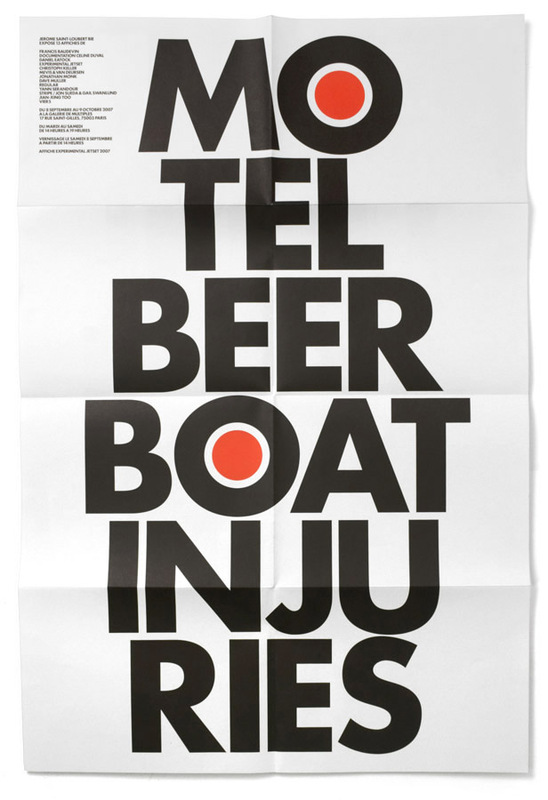 'Jérôme Saint-Loubert Bié', written large, like a classic solo exhibition poster. Staring at the sketch, the French name Jérôme Saint-Loubert Bié became more and more foreign to us, until we just saw a swirl of letters. That's when we figured we should do something with the concept of anagrams. As can be seen above, we added some red dots to the posters, to turn the O's into targets, emphasizing the 'bomb' part. As we wrote later to Jérôme, it was interesting that a lot of the words that were generated by his name were in fact quite disturbing: bomb, airline, route, ruin, jumbo, jet, robot, meteorite, tomb, babel, etc. The whole anagram concept had unleashed an swarm of unexpected Nostradamus-like predictions. That's why the posters almost resemble newspaper headings, or even warning signs. 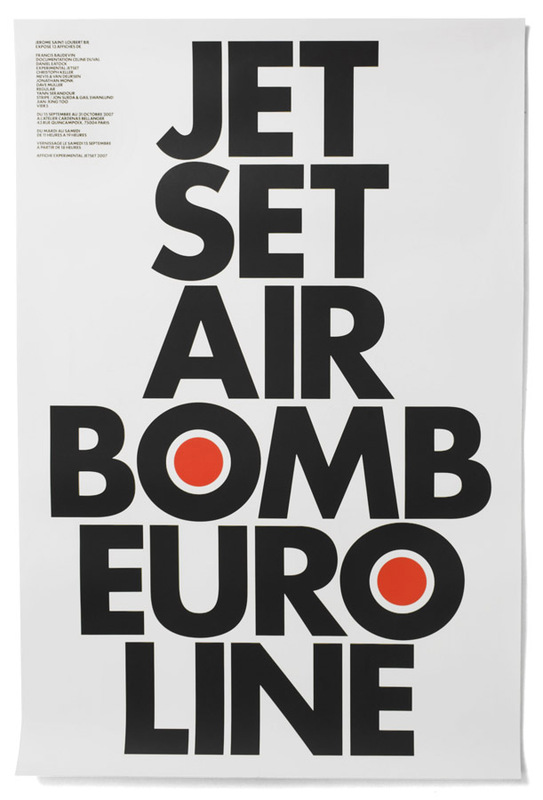 The size of each poster is 60 x 90 cm, printed in an edition of 100 copies per poster. The exhibition in Atelier Cardenas Bellanger took place between September 15 and October 31, while the exhibition in Galerie de Multiples took place between September 8 and October 9, 2007. Participating designers included Mevis & Van Deursen, Christoph Keller, Daniel Eatock, Regular and Vier5.